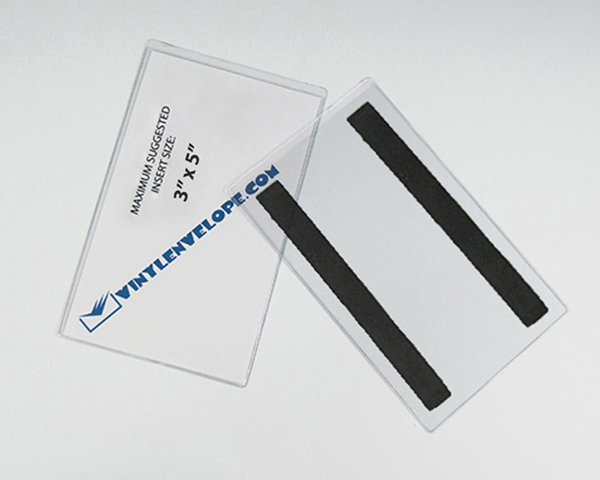 High-quality clear vinyl pocket with two 1/2" x 4" adhesive magnetic strips applied to the back. Use to store or protect practically anything you can imagine. Made from heavy 8-gauge clear material on the front and back. Use the magnetic strips to attach the pouch to practically any magnetic-receptive metal surface. Why are our prices lower than what you see elsewhere?. Because we are the manufacturer of this product so you get more for your money. Pocket dimensions: 3 1/4" x 5 1/8"
Maximum insert size: 3'' x 5"
Magnet dimensions: .045" thick x 1/2" x 4"
Store, display or protect your documents or other items. Organize your warehouse, store or closet. There are endless uses for clear magnetic vinyl pouches. Other sizes available. This item is sold in packages of 100 pieces. Please order in increments of 100. Contact us for prices on larger quantities, different magnets, additional sizes, custom colors of material and printing.